New Delhi, January 14: Unfolding the blindfolds, the atrocities faced by Hindu community in Pakistan is something that everyone needs to spare a thought on. Forceful marriages, sexual exploitation of girls, a biased government with terrible control on law and order, forceful conversion from Hindu to Islam is something the Hindus have been going through for years and therefore have come down in their homeland, India, in a hope to shower a beaming light on their plight. Highlighting atrocities of Hindu minority, a documentary by Prakash Jha ‘Who am I?’ rightly targets the plight of displaced Hindus from Pakistan. Forced conversion to Islam, especially targeting young girls have led tremendous fear among the people who are going through ‘silent’ religious persecution in Pakistan. The issue is big, as Hindu community of Pakistan, has been subjected to the gravest human rights violations in Pakistan and deprivation of basic amenities and lack of support. The documentary aims to deliver the story giving utmost emphasize on the challenges faced by the people who dwell on returning back to India and the financial issues faced by them. It also stresses how the young Hindu girls in the country are forcefully abducted and harassed by the landlords, police and local Pakistanis. The forced conversions and abductions of non-Muslims living in Pakistan are hushed-up whereas ‘victories’ such as the one we witnessed this week are publicized on national television, further intimidating and isolating minorities. Constituting only 2% of the entire population of Pakistan, the atrocities on these people are way too high. The impotence of Pakistan’s so-called democratic government in the face of fundamentalist dominance also has created menace for the minorities. The Constitution and laws of the land are overwhelmingly preferential to Islam, the State Religion, and Muslims. Many Hindu temples have been violated, destroyed, or converted into government offices in Pakistan. Despite the official promises to rebuild these temples, in many cases, little or no action has been taken to redress the situation. Illegal encroachments on Hindu temples and lands, molestation and abduction of Hindu girls, demanding of huge ransoms in kidnap cases, and frequent arrests of Hindus on false charges have become commonplace in Pakistan. 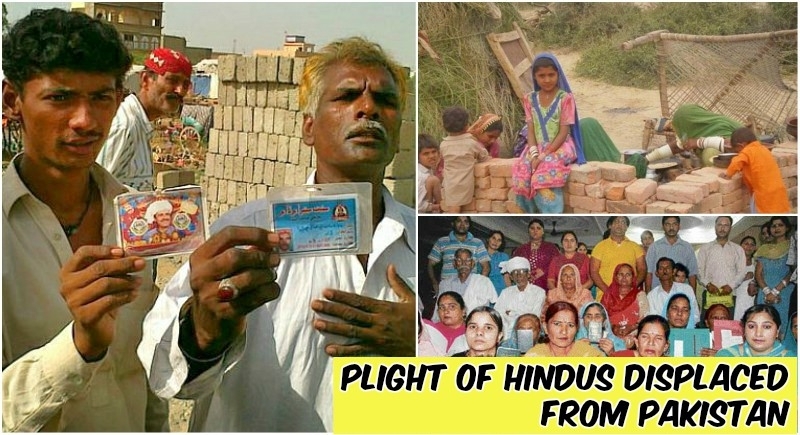 Understanding the plight of the people and bringing back the lost homeless Hindus to their motherland, Narendra Modi led government introduced the ‘Citizenship Amendment Bill’ which compel on bringing back the Hindus from Pakistan, Afghanistan, and Bangladesh. However, the bill could not fructify in the just-concluded winter session but the people have not given up their hopes. Attributing that the bill provides for according Indian citizenship to the Hindus, Jains, Christians, Sikhs, Buddhists and Parsis from Bangladesh, Pakistan and Afghanistan after six years of residence in India instead of 12 years even if they do not possess any document. Under the 1955 Act, one of the requirements for citizenship by naturalization is that the applicant must have resided in India during the last 12 months, and for 11 of the previous 14 years. Hailing from Sindh and Khyber Pakhtunkhwa, the people reside here on the basis of a temporary visa, which is extended from time to time. Without any provision for getting long-term visas, Hindu and Sikh migrant families from Pakistan are trying relentlessly to get their visas renewed. Another problem for these families is to find suitable guarantors for their visas. The movement of Pakistani passport holders is also restricted. Since 2016, according to the Gazette of India notification, the Ahmedabad district collectorate has awarded citizenship to 320 people. No other district in the country has awarded these many certificates of citizenship. 90% of the 320 applicants were from Pakistan, while the rest were from Bangladesh. 431 Pakistani Hindus in 2017 were given Long Term Visa in line with the Modi government's policy to help rehabilitate minorities who fled from Pakistan, Bangladesh, and Afghanistan. Significant populations of Pakistani Hindus live in 400 refugee camps across the nation living particularly in Jodhpur, Rajasthan, and Delhi. The plight of these people needs the world’s attention towards the atrocities they face daily in Pakistan and a different kind of struggle which goes on after coming to India. Global awareness could end half of their problems. It is appalling to know that many of us fail to understand that spirituality and religion are a matter of choice. Advertising and exhibiting religion is neither permissible in Islam nor is recommended by the ethical parameters of any progressive society. We talk about atrocities carried out in Indian Kashmir and the Gujrat riots but forget about the minorities who are living in constant fear of their lives, legacies, and children.